It could be one for the record books. Trade negotiators from 12 Pacific Rim nations, including the United States, Japan and Singapore, struck a deal on the Trans-Pacific Partnership (TPP) on Monday (Oct 5) that will create the world's largest free trade area and one that will have a transformative impact on the global economy. Speaking at a joint press conference in Atlanta, Georgia, where negotiators had toiled round the clock for five days to seal the deal, ministers took turns hailing the historic nature of the deal. US Trade Representative Michael Froman said: "At the end of the day, here we are as 12 TPP partners having achieved something that some time ago people didn't think was achievable." And though negotiators acknowledged there were difficult issues not resolved until the last minute - New Zealand said its negotiation on dairy ended only at 5am - the big picture was more important. Singapore Minister for Trade and Industry (Trade) Lim Hng Kiang said the TPP embodies "what Singapore sees as the future of the Asia-Pacific". "It will transform the region by reducing tariff and non-tariff barriers substantially for both goods and services, encouraging greater investment, and addressing new trade challenges in the modern economy. "The TPP has also been deliberately designed to be more inclusive, so that small and medium-sized enterprises can take full advantage of its benefits," he said in a statement. The agreement was an important milestone for negotiations that have gone on for nearly eight years, but few will be celebrating yet given the difficult ratification process ahead. Before the TPP can come into force, member countries must first get it approved by their domestic legislatures. That process is expected to be especially challenging in the US, where polarising presidential election politics is increasingly coming into play. Under the fast-track legislation President Barack Obama signed in June, Congress will have at least 90 days to review the deal. Mr Obama, who made the TPP a priority of his second term, said the deal "reflects America's values and gives our workers the fair shot at success they deserve". "When more than 95 per cent of our potential customers live outside our borders, we can't let countries like China write the rules of the global economy," he said in a statement. China is not a member of the TPP. But already, senators from both sides - Democrat Bernie Sanders and Republican Orrin Hatch - have come out to criticise the trade deal, with Mr Hatch calling it "woefully inadequate". Mr Obama will need the support of traditionally pro-trade Republicans if he is to get it through Congress. But it will not be just the US that faces obstacles, there are potentially politically difficult aspects for other nations. The issue of agriculture tariffs remains an issue for countries like Japan and Australia; labour standard requirements are a worry in Vietnam; and many in Malaysia have concerns about how the TPP might undermine bumiputera rights. 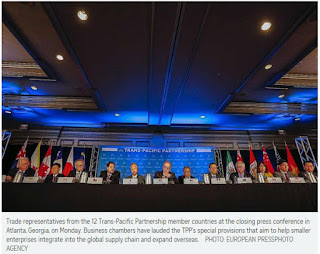 The Trans-Pacific Partnership (TPP) will transform the region by reducing tariff and non-tariff barriers, encourage greater investment, and address new trade challenges in the modern economy, said Minister for Trade and Industry (Trade) Lim Hng Kiang yesterday. The trade deal, which was struck in Atlanta yesterday after more than five years of negotiations, "embodies what Singapore sees as the future of the Asia-Pacific", said Mr Lim. "The TPP has also been deliberately designed to be more inclusive, so that small and medium-sized enterprises can take full advantage of its benefits," he added. The agreement is expected to boost trade and investment flows between TPP countries as well as integrate the region into a single manufacturing base and market, the Ministry of Trade and Industry (MTI) said in a statement yesterday. Singapore companies will benefit from increased market access with all 11 other TPP countries, which include some of the Republic's largest trading partners such as Malaysia, the United States, Japan, Australia and Vietnam. The ministry said the deal's updated trade rules will assure Singapore investors and traders of a more open, predictable and transparent environment, and also create more opportunities for Singapore-based companies. The 12 TPP countries "will work intensively to tie up remaining details, and produce the final text for public review", MTI said. "The countries will also each begin respective domestic approval processes, to bring the TPP into force as soon as possible." The deal was also welcomed yesterday by Japanese Prime Minister Shinzo Abe, who said it would benefit both Japan and the Asia-Pacific region, reported Reuters. "It is a major outcome not just for Japan, but also for the future of the Asia-Pacific," Mr Abe told reporters shortly after the deal was clinched. While not part of the pact, South Korea's Trade Ministry said yesterday that it hopes to join the partnership as soon as possible. "With the agreement being reached, South Korea will actively examine details of the new trade arrangement and analyse its impact on its own economy," Assistant Minister for Trade Negotiations Kim Hak Do was quoted as saying by Yonhap news agency. South Korea already has existing free trade agreements with 10 out of the 12 countries involved in the TPP. Mr Kim said Seoul has been engaged in talks with all the TPP nations and they agreed that "it makes sense for it (Korea) to join". However, he noted that factors like pace of ratification and terms for later entrants will determine how soon South Korea can join the TPP. Japanese car and vehicle-parts makers may be the biggest winners, as they get cheaper access to the United States, the industry's biggest export market. Australia will gain access to the US sugar market while Japan will also reduce levies on the product. The cut in the beef tariff will help Australian ranchers, while tariffs will be dropped for seafood and most horticultural products. Preferential quota access will be created for grains and cereals. New Zealand, along with Australia, successfully pressured the US to curb protectionism for new biotech drugs from the minimum of 12 years to five years. That could lead to cheaper drugs and more competition.The dairy industry, which accounts for about a quarter of the country's exports, will see savings of about NZ$102 million (S$94 million) a year. Tariffs will be eliminated on 93 per cent of the country's trade, including on beef exports, seafood, fruit and wine. Reduced import duties in the US and Japan will benefit the country's apparel makers, while its fishing industry will benefit from the elimination of import tax on shrimp, squid and tuna, now averaging at 6.4 to 7.2 per cent. Its electronics, chemical products, palm oil and rubber exporters are among the beneficiaries. Japanese rice farmers will lose some of their protections with a non-tariff import quota of 1 per cent of total rice consumption. Eliminating import taxes on pharmaceutical products from the current average of about 2.5 per cent will lead to tougher competition between domestic companies and foreign players. Its state-owned enterprises may suffer from the deal, which calls for equal access to government procurement. The second-biggest economy may be among the biggest losers as it failed to join the TPP, allowing the US to tighten trade ties across the region and advance the Obama administration's so-called pivot to Asia. Chinese exporters may lose some market share in the US and Japan to developing countries such as Vietnam. Business associations and companies here have welcomed the Trans-Pacific Partnership (TPP), saying it will create new opportunities and boost trade in the region. But they also warned that ratification of the treaty by member states will be the more difficult step and is by no means a done deal. The TPP is a far-reaching agreement involving 12 countries which make up 40 per cent of the world economy. The deal was finally struck in the US city of Atlanta on Monday after five years of intense negotiations and must now be signed formally by the leaders of the 12 nations - Australia, Brunei, Canada, Chile, Japan, Malaysia, Mexico, New Zealand, Peru, Singapore, the United States and Vietnam - and ratified by their parliaments. The TPP agreement could open up new opportunities, strengthen trade and investment rules, and improve business conditions in the region, the Singapore Business Federation (SBF) said. SBF chief executive Ho Meng Kit told The Straits Times that it is still too early to identify specific areas of concern for the business community as the details are not yet available. The top priority now is to get the deal ratified in key economies such as the United States, he said. Singapore International Chamber of Commerce chief executive Victor Mills agreed, noting that the deal accomplishes the key strategic imperative of anchoring the US to the Asia-Pacific region. "This strategic imperative has always been Singapore policy and even more so in recent years to balance the rise of China and Chinese maritime ambitions," he said. 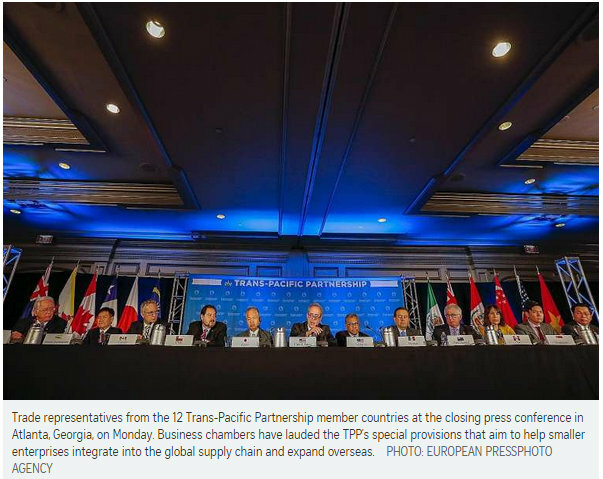 Business chambers also lauded the TPP's special provisions that aim to help smaller enterprises integrate into the global supply chain and expand overseas. "What's most important is for SMEs to put in place an actionable plan to expand into the region. If our SMEs are slow to move, they will lose out," said Association of Small and Medium Enterprises president Kurt Wee. Besides opening up trade between member countries, however, the TPP also contains rules on a range of controversial issues, some of which could affect Singapore. For instance, the pact includes a mechanism that will allow foreign investors to bring TPP governments to arbitration. Critics fear that this will undermine the ability of governments to regulate multinational firms. The agreement also addresses issues such as the development of the digital economy, and the role of state-owned enterprises in the global economy. 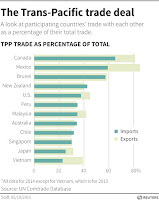 Singapore already has free trade agreements with all of the TPP countries except Canada and Mexico. But the TPP will do more than broaden Singapore's access to freer trade in new markets, said DBS economist Irvin Seah. The agreement will also deepen the Republic's existing trade relationships by including components which were left out of previous agreements. For instance, the pact will allow Singapore companies to participate in government procurement projects in TPP member countries. HSBC economist Frederic Neumann noted that the details of the agreement have so far been sketchy, with consumers unclear of the benefits or costs of the deal. But with more information on the deal likely to be released, there could be fierce opposition, especially in South-east Asian countries where "suspicion over foreign involvement in local economies remains strong", he noted. For at least one company, the benefits of the trade deal are clear. Mr Gary Lee, deputy general manager for export sales and marketing at food and beverage group Tee Yih Jia, said the company hopes to ramp up exports to South American markets such as Chile and Peru, which are part of the TPP. The Obama administration may be hailing the 12-nation Trans-Pacific Partnership (TPP) free trade agreement as a historic victory, but it is far from a done deal among some key players, say analysts. Details of Monday's agreement are yet to be made public and on both sides of the Pacific, it still faces potential hurdles when sceptical legislators examine its merits during a 90-day review and ratification process. The TPP needs to survive the United States legislature at a time when the political climate could not be more complicated. Nearly every observer who spoke to The Straits Times prefaced their remarks with the same words: "If it passes Congress." Meanwhile, Malaysia's embattled Prime Minister Najib Razak will have to convince his MPs that the agreement would "ensure Malaysia's positions and interests are safeguarded", as stressed by International Trade and Industry Minister Mustapa Mohamed. The Malaysian opposition has repeatedly raised questions over whether the deal benefits Malaysia, given concerns over steep protection of intellectual property, especially the cost of medicine, the status of state-owned enterprises and government procurement in terms of preferential treatment for Malay and bumiputera communities. Mr Wan Saiful Wan Jan, head of policy think-tank Ideas, told The Straits Times that if the TPP became a source of controversy in Parliament, Datuk Seri Najib would sacrifice it if it endangered his leadership. In Japan, the signed treaty must be examined by both Houses of Parliament, Kyodo News reported, and Bills will be deliberated separately if the contents of the TPP require revisions to existing laws. The government is considering holding an extra Diet session through early next year, according to people close to the administration. A failure to complete the necessary legislative process during the extra session could cause several months of delay. The deal has become a politically loaded subject in Canada in the run-up to tight Oct 19 elections. Prime Minister Stephen Harper's rivals have raised concerns about opening Canada's mostly closed dairy sector and losing its status as a favoured supplier of auto parts to the US auto industry, Agence-France Press reported. The main opposition New Democrats say if they form the next government, they will not feel bound by the TPP's terms, Reuters reported. In the US, where President Barack Obama has to give Congress 90 days' notice of his intention to sign the accord, the major concerns are twofold. First, the agreement comes amid Republican Party uncertainty about the future of its leadership and, second, the vote on the deal will take place during the heat of a presidential election campaign. Dr Patrick Cronin, senior director of the Asia-Pacific Security Programme at the Centre for a New American Security in Washington, stressed that approval needs to happen before the presidential campaign begins in earnest. Already, the review period likely pushes the earliest lawmakers can vote on it till after the first presidential primaries in February. "If they can't pass it quickly, within a month of the end of the review period, it will languish and people will pick at it, and it may not happen until after the election," Dr Cronin said. The election year, he noted, can put particular stress on a controversial issue like this as politicians tend not to take risks. "Even (former secretary of state) Hillary Clinton, who everybody knows is really in favour of this, is essentially saying she is not," he said. The relative secrecy of negotiations thus far also means it is difficult to predict what elements of the deal could become a stumbling block. "To date, many members of Congress with specific concerns and interests in the TPP have had very little input into the negotiations, and the draft texts have not been shared with voters, so the text, though agreed with the negotiating partners, faces close scrutiny domestically," said Ms Lisa Sachs, director of the Columbia Centre on Sustainable Investment at Columbia University. The opposition of Senator Orrin Hatch, the Republican chair of the Senate Finance Committee, is also a worrying sign for TPP support in Congress. In a break with the Obama administration, Hillary Clinton just officially came out against the hotly contested Trans-Pacific Partnership. China, the biggest economy to be excluded from the Trans-Pacific Partnership (TPP), has made a veiled call for the trade pact to observe international rules and contribute to the Asia-Pacific. The Chinese Commerce Ministry said yesterday that China is "open to any mechanism that follows the rules of the World Trade Organisation and boosts the economic integration of the Asia-Pacific". "We hope the TPP and other free trade arrangements in the region can boost each other and contribute to the Asia-Pacific's trade, investment and economic growth," the ministry added in a statement on its website. The Chinese media has mostly downplayed the TPP - viewed here as one of Washington's tools to curb Beijing's rise - and questioned whether members could get domestic approval in time. Observers say the TPP would pose challenges for China's economy and influence, making its counter-efforts more crucial now. These include revival of two ancient trade routes under the "One Belt, One Road" (Obor) initiatives aimed at deepening trade links. People's Daily senior editor Ding Gang noted that the TPP would affect China's manufacturing sector, given that a prescribed proportion of a product would have to comprise items sourced from TPP members to enjoy lower tariff. He also believes the pact could affect the Obor initiatives, as they do not have any free trade element. "Some countries might be more inclined to join the TPP," Mr Ding wrote in a commentary yesterday. China is aiming to conclude talks this year on the 16-nation Regional Comprehensive Economic Partnership comprising Asean as well as India, Japan, South Korea, Australia and New Zealand. China has also inked several free trade agreements lately, such as with Australia, to counter the TPP's impact. Debate was again stirred yesterday on whether China should join the TPP. Some observers say joining the free trade agreement before China can meet the standards may do more harm to its image and businesses. Financial commentator Lei Sihai said the key obstacle is the TPP's investor-state dispute settlement mechanism, which allows foreign investors to take action against host states over the impact of national laws or policies. "In the light of the impact on our national sovereignty, the likelihood of China joining the TPP is remote. China will need to use its own tactics to counter the US' master plan," he wrote in a commentary yesterday. 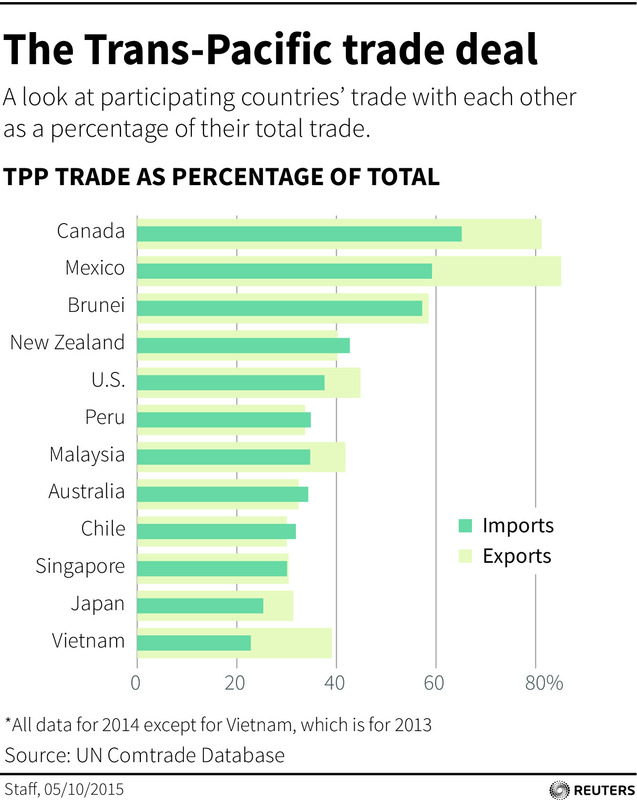 What's in the Trans-Pacific Partnership? Get the facts on the brand new website!